What makes a choice rational? A common answer is that a rational agent calculates the probable net benefits of each possible course of action and chooses the one that best satisfies his or her given preferences. Rational choice is thus about means, not ends, a view which has been most deeply analyzed in economics, and that is now becoming crucial throughout the social sciences. 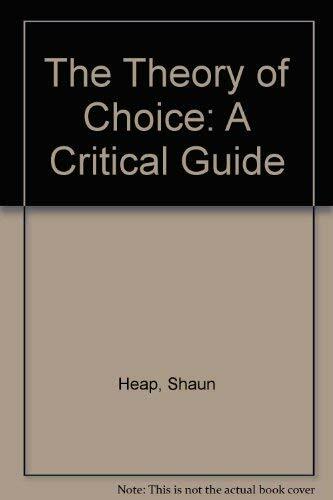 "The Theory of Choice" provides a comprehensive introduction to the fundamental principles of rational choice theory, game theory, their implications and limitations. The book is in three parts with a section of keywords. Part 1 covers individual choice, analyzing the theory of decision making by an individual who need not consider the effect on other people's decisions. This includes the study of rationality, consumer theory and autonomy. Part 2 examines interactive choice in which the actions taken by one person depend on, and influence, those taken by others. The final part covers collective choice where individuals group together to agree a common strategy or policy, which is then implemented. This section includes surveys on social choice, democracy, power and social justice.